If you are thinking about learning to play the guitar or just starting to learn, chances are you will (or already have) make an investment in a guitar. It's a good purchase. There is nothing like having a new guitar sitting around your house to motivate you to practice! So now that you've taken the plunge and bought a guitar, the best thing you can do is to get it setup. What does 'setup' mean? Well, it basically means to get a tune-up so it is ready to play. I liken it to an alignment for your car. It is something that periodically gets out of whack and needs to be adjusted to perform at a high level. Proper guitar setup should be a customized process so it is right for YOU. At its basic form, it involves adjusting the action - which is the distance the strings are from the neck - to suit your playing style and skill level. For beginners, the strings should be closer to the neck; whereas for more advanced players may want the strings adjusted to suit their playing style. When you take your car in for an alignment, the mechanic will often offer a multi-point inspection. It usually involves checking your fluids, brakes and tire pressure. Likewise, a good set up, will include a similar multi-point inspection of your guitar. This often involves a good cleaning, changing the strings, and checking for other adjustments that could be made. Where can I get my guitar setup? Almost any music store will offer guitar setup. It usually costs only about $25 for a basic setup job. It may cost extra if additional adjustments are necessary, depending on what the adjustments are and store you are at. I highly recommend you play it right at the store, after the setup, to make sure you are happy with it or if more adjustment is needed. 1. Local music store. Places like Guitar Center or even a non-chain store should have a guitar tech which has the ability to perform a basic guitar setup. 2. Do it yourself. There is plenty of information available for setting up a guitar. Make sure you do your research before you follow a YouTube video or article as you want to ensure it is a proper setup. Learn & Master has a Guitar Setup and Maintenance course that teaches you how to properly setup your guitar and do regular maintenance. 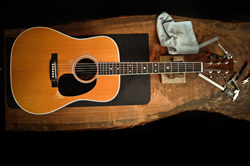 Master Luthier, Greg Voros, is the instructor and you can learn how to care for your guitar without taking it to a repair shop. However, if you are a beginner, I recommend taking to a professional to do the first few times. If you are going to try it yourself, get lots of good information or you may risk damaging your instrument. Many factors contribute to needing a setup - humidity changes, temperature changes, and just time. Any time you get a new instrument have it set up and then usually about once a year take your guitar in for a setup. You will immediately notice a difference after a proper setup, just like an alignment on your car. Remember, a setup is something you probably want to do on a yearly basis. Guitar playing should be fun, but it can be a burden when on an instrument that is hard to play. 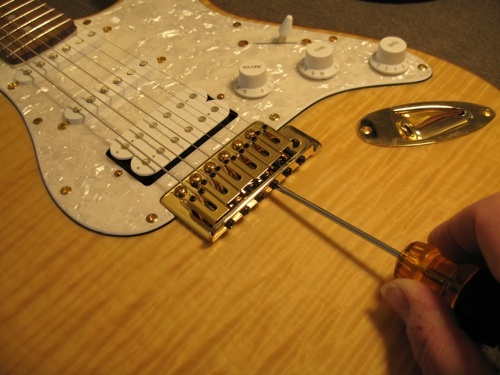 It's a small adjustment that can make a BIG difference in the overall playability of your guitar. Do yourself a favor and get a setup job done on your guitar!